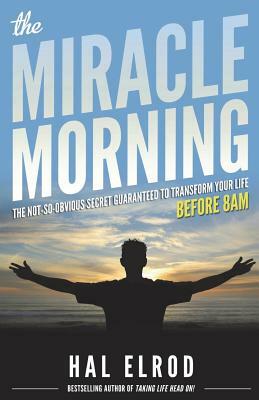 "Hal Elrod is a genius and his book The Miracle Morning has been magical in my life. What Hal has done is taken the best practices, developed over centuries of human consciousness development, and condensed the 'best of the best' into a daily morning ritual. A ritual that is now part of my day." What if you could wake up tomorrow and any-or EVERY-area of your life was beginning to transform? What would you change? The Miracle Morning is already transforming the lives of tens of thousands of people around the world by showing them how to wake up each day with more ENERGY, MOTIVATION, and FOCUS to take your life to the next level. It's been right here in front of us all along, but this book has finally brought it to life. Are you ready? The next chapter of YOUR life-the most extraordinary life you've ever imagined-is about to begin. Buy the book and WAKE UP to your full potential. Hal Elrod is on a mission to Elevate the Consciousness of Humanity, One Morning at a Time. As the author of one of the highest rated books in the world, The Miracle Morning (with 2,300] five-star reviews averaging 4.6 stars, which has been translated into 27 languages and is practiced daily by over 500,000 people in more than 90 countries)... he is doing exactly that! What's incredible is that Hal literally died at age 20. His car was hit head-on by a drunk driver at 70 miles per hour, his heart stopped beating for 6 minutes, he broke 11 bones and woke up after being in a coma for 6 days to be told by his doctors that he would probably never walk again. Not only did Hal walk, he ran a 52-mile ultra-marathon and went on to became a hall of fame business achiever, international keynote speaker, author, and grateful husband & father-all before he turned 30. Then, in November of 2016, Hal nearly died again - his kidneys, lungs, and heart were failing, and he was diagnosed with a rare, and very aggressive form of leukemia. After enduring the most difficult year of his life, battling cancer, Hal is now in remission and furthering his mission as the founder of The Miracle Morning book series, host of the "Achieve Your Goals" podcast, creator of the Best Year Ever [Blueprint] LIVE event, and Executive Producer of The Miracle Morning MOVIE - a documentary that reveals the morning rituals of some of the world's most successful people. Hal is grateful to be alive and living his mission alongside his wife and their two young children in Austin, TX. To contact Hal about media appearances, speaking at your event, or if you just want to receive free training videos and resources, visit www.HalElrod.com.